The A129 Duo is a dual camera launched in 2018 from the Chinese manufacturer VIOFO. 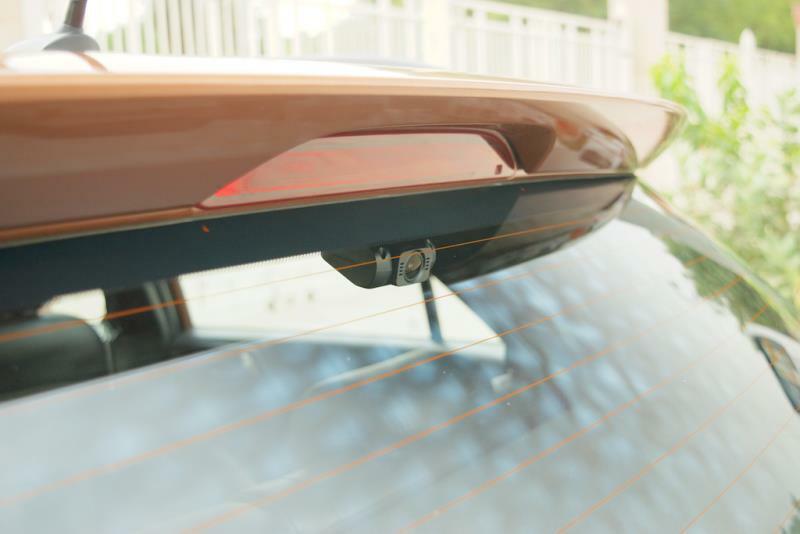 Like many of the previous VIOFO models, the A129 is a wedge shaped camera allowing for a very discreet installation. The A129 Duo is using the Novatek NT96663 processor and the Sony STARVIS IMX291 CMOS sensor for the front camera. It also uses the same Sony STARVIS IMX291 for the rear camera. 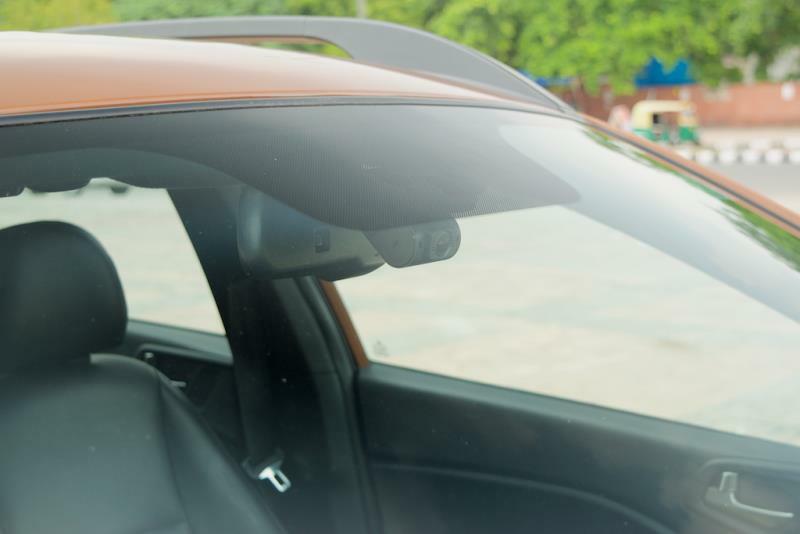 The IMX291 is one of the best low light sensors available in a dash cams in 2019 and is one of the best for night recording. The A129 Duo can record at 1080p 30fps for both the front and rear camera. Video quality during the day is very good and night quality is good as well for both front and rear cameras. Very few cameras perform better at night. Other key specs of the A119S are the same as the A119. The A129 duo is similar to other wedge shaped Viofo cameras (A119 series) from a shape perspective. 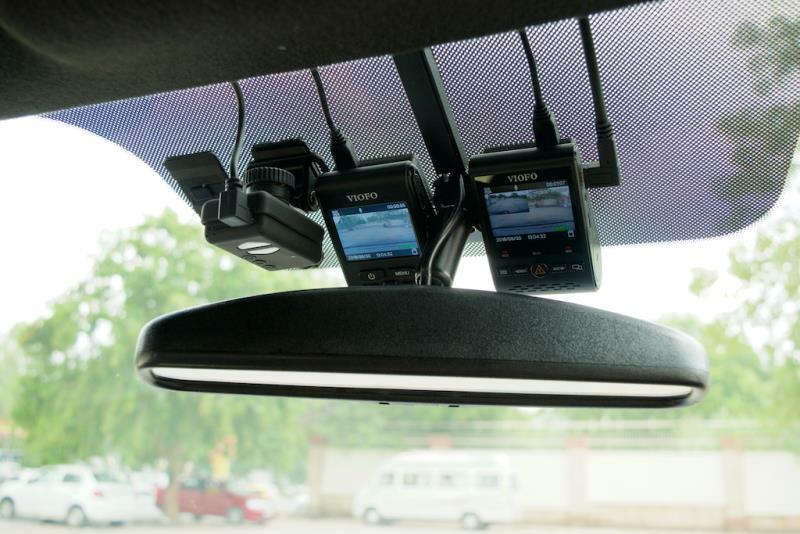 It comes with a 2″ screen and an optional GPS mount. 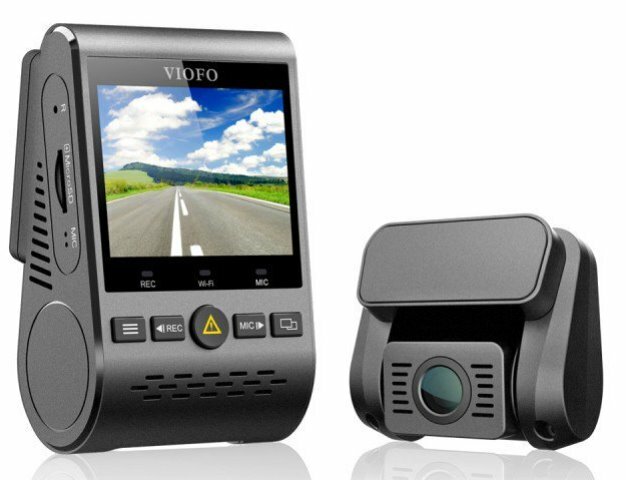 Build quality is good and is improved over previous VIOFO models in the A119 series. Members have noted more shielding of internal components as well and the GPS mount has been redesigned to ensure a firm hold on the camera. Note that the A129 does not come with a power button but if you hold down the menu button, the camera can be powered on or off. Also the camera uses super capacitors instead of batteries which makes it better suited for hot environments. The camera also comes with WiFi and there is an optional Circular Polarizing Lens (CPL) available as well. A new feature for this camera is an optional Bluetooth emergency lock button. Our member Harsh provided a comprehensive review on our forum here. He has provided a photo of the package contents as seen below. Auto Event Detection (almost same as motion detection): When a moving objects is detected while parking, a video is recorded for 60 seconds. This recording mode is not pre-buffered so it is not ideal if you are hoping to capture the moment of impact. Time Lapse Recording at 1fps, 2fps, 3fps, 5fps or 10fps. While parked, the camera will be always recording at the low fps but no audio is recorded. The A129 Duo can be hardwired with a 2-wire or 3-wire kit. With the 2-wire kit, parking mode is entered after 90 seconds with no motion. Parking mode is exited when G-sensor is triggered or average GPS speed is greater than 8 KM/H. With the 3-wire kit will enter and exit parking mode based on the Accessory (ACC) signal switching on and off. The 3-wire kit is the better choice to switch between driving and parking mode. Our member Harsh has provided the following size comparison photos. A119 on the left, A119S in the middle, A129 on the right. Currently there doesn’t appear to be any widespread / systemic problems with the A129 Duo. Our member Harsh provided the following photos of the A129 mounted. Mobius on the left, A119S in the middle and A129 on the right. The VIOFO A129 Duo is one of the best dual cameras available given its video quality for both front and rear due to the Sony STARVIS IMX291 sensors used for both cameras. The other aspects of the camera are excellent as well including the discreet wedge shaped form factor, excellent build quality and good reliability. While the A129 Duo does not have prebuffered parking mode when hardwired, the time lapse and low bitrate parking modes work well. While not the cheapest dual camera, price is reasonable given the overall quality provided. Definitely an excellent buy. See what other owners have to say about the A129 on our forum. 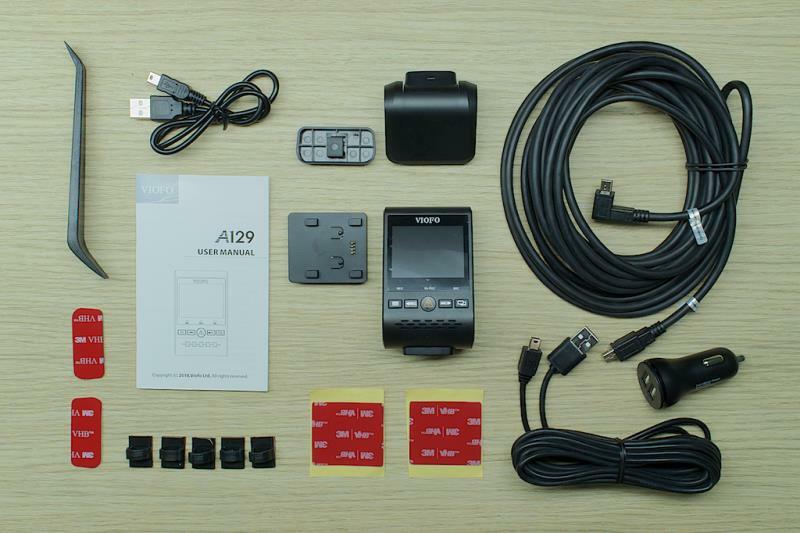 The A129 Duo sells for approximately $170. Confirm it is the Duo version (with both front and rear cameras) before ordering. Insert the microSD card into the camera and power it on via a 5V/1A power source. Do not use computers USB ports, they do not supply enough power. While upgrading, the front REC red LED starts blinking (the light blinks slowly at the beginning, then blinks quickly), when the lights stop blinking, the firmware upgrade is finished. The camera will restart and the firmware file will be deleted automatically. IMPORTANT!! Now go into the menu and manually default your cameras settings. Do not miss this step! Final Word Great value for a excellent dual camera. A step above the Mini 0906 from a video and reliability perspective.